A slice-of-life graphic novel that perfectly captures the frustrations and small anxieties of early teen life. The illustrations are gorgeous, simple in style but so expressive of emotions and vividly showing the atmosphere of Summer by the beach. The book is entirely printed in shades of blue, and reading it sometimes felt like looking at everything underwater. Yes, there isn’t much in the way of plot progression or character development, but that to me was the charm of the story. Life isn’t always marked by momentous realisations or dramatic events, instead it is a slow accumulation of experiences, errors, embarrassments and kindnesses. 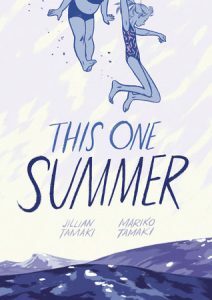 The main character is cruel to her parents, selfish, a mediocre friend, develops a crush on someone to whom she is invisible, and spends a fair bit of Summer alternating between sulking about being misunderstood and giving in to the child-like delight of hanging out on holidays with a friend. All of these things captured in one way or another different moments from my experiences at that age, and because of that the story felt layered with meaning. In particular the tension between the main character and her parents was interesting. She cannot understand her mother’s sadness and isolation(view spoiler)[, and her mother in turn does not want to share her experience of miscarrying that is so deeply affecting her (hide spoiler)]. The relationship between mother and daughter is fraught, and there is no resolution forthcoming but I would have been disappointed if something so complex had all been wrapped up at the end. The main message of the story seems to be that relationships as are complex, layers and always changing. Which is something I enjoyed reflecting on accompanied by such gorgeous illustrations.